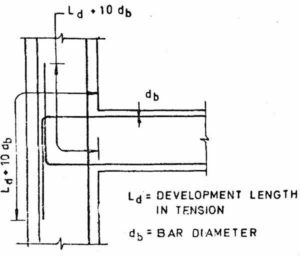 The development length can be characterized as the length of the bar required for transferring the stress into the concrete. A development length is the quantity of the rebar length that is actually required to be enclosed into the concrete to make the desired bond strength between two materials and furthermore to produce required stress in the steel at that area. σs = stress in the bar at the section considered as design load. In the below example, we need 10 db development length at the end section so that the concrete-steel bond stays continuous. The bar is bent because there is no space available at the end section. You can see that only 90-degree configuration is used but here we can use more configuration like that. The ascertained compression or tension reinforcement at every section of an RC member is produced on both sides of that section by hooks embedded length or mechanical gadgets. If the restraining section of concrete is relatively thin and unable to withheld the position of highly stressed bars the development length is given. In this way, the splitting of bars from concrete is avoided. The additional embedded length is known as development length. The main aim is to give proper and settled support to the bars. In compression reinforcement, hooks are not provided but where no or little space is available for extra length, hooks can be used for restraints. dear sir i am a fresher in civil engineering. i am going to build a 10ft*10ft room with front verandah for a industry worker colony.total 10nos of rooms.please help me towards design of coloumn foundation and slab.please guide me for structural design. thank you.